Joan Ling Named Third District ‘Woman of the Year’ The Urban Planning alumna and lecturer was honored on March 9. Urban Planning alumna (MAUP ’82) and adjunct professor Joan Ling was recently named “Woman of the Year” in Los Angeles County’s Third District for her work to improve public policy, legislation, and government regulations that impact quality of life. According to Kuehl’s website, the Los Angeles County Commission for Women and the Board of Supervisors honored a “Woman of the Year” from each Supervisorial district in celebration of Women’s History Month (March). Last year, Ling was the Department of Urban Planning’s Alumna of the Year. Her projects include the first multi-family structure in the country awarded the gold certification by the U.S. Green Building Council’s Leadership in Energy and Environmental Design (LEED). To read more about Ling’s accomplishments from Supervisor Kuehl’s website, go here. “I wouldn’t have gotten this job if I hadn’t come to school at UCLA Luskin School of Public Affairs in the Urban Planning program,” says Adam Monaghan. He’s reflecting on his academic and career journey days before he crosses the stage at commencement on June 13 with his master’s degree. And, no, we didn’t ask him to say that. The job Monaghan is referring to is with real estate development company, Community Dynamics, which teams up with municipal agencies and financial institutions to create sustainable communities that attend to the needs of residents, such as proximity to workplaces and access to transportation, schools, day care and recreation. For Monaghan, it’s an opportunity that presented itself in the last quarter of his degree program. Along with many other talented and ambitious UCLA Luskin graduates, he will be starting his new position a few days after receiving his diploma. Monaghan’s introduction into the urban planning world was as fortuitous as it was unexpected. After graduating from Boston College with a theology degree and a penchant for travel, Monaghan left home to fulfill his two-year commitment with the Peace Corps. His assignment was in Guajiquiro, Honduras. His job was to be an urban planner – a field he knew nothing about. 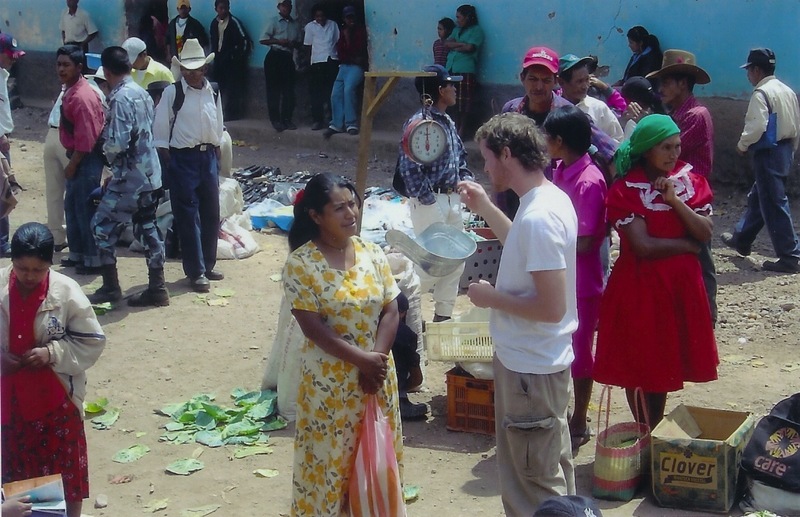 Adam talking to villagers in Guajiquiro, Honduras, during his time as an urban planner for the Peace Corps. After initial training and on-the-job learning through immersion and help from fellow urban planning volunteers who had interrupted their work or retirement to also join the Peace Corps, Monaghan found himself helping to draft a 10-year strategic plan for economic and infrastructure development in Guajiquiro, and managing a project to design a potable water system for 2,700 people in six villages. It was through the work that Monaghan learned he had a knack for it, and the passion. 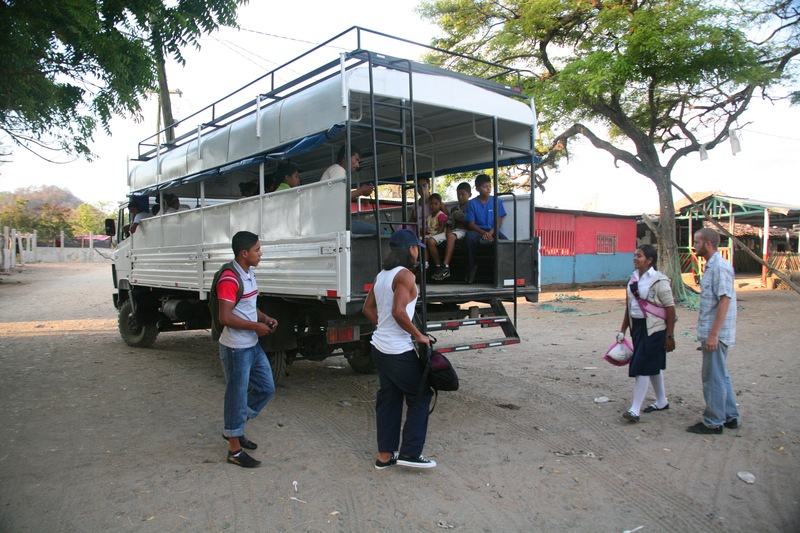 When his stint with the Peace Corps ended, Monaghan landed in Nicaragua. He’d gone there on a surfing trip with Nick Mucha, a friend he met in the Peace Corps, and discovered that the waves were attracting scores of surfers and tourists to the small fishing village of Gigante. With his urban planning hat on, Monaghan settled in the town and spent time talking to the locals about organizing a development team. He and Mucha founded Project Wave of Optimism aimed at helping the community capitalize on the inevitable transition into a tourist destination and foster development in a sustainable way. Key to Project WOO’s development model, Monaghan says, was that projects were voted on by the town’s residents, so that they had a voice in getting what they wanted. By fundraising through individual donors and securing corporate sponsors, Monaghan and Mucha purchased and converted a truck into a bus that would transport people easily in and out of town – something that had never before existed. “I facilitated a process where local people were able to share their ideas about community development. It was like community organizing, which is what we did in the Peace Corps – going door-to-door from town to town. After coming to Luskin I learned that what I was doing is called ‘local participatory planning and based on the theory of communicative action in the urban planning world,’” Monaghan says. Incidentally, his non-profit has recently opened a health center and is hosting a UCLA Public Health intern this summer. Project WOO is expanding and can also be an internship destination for UCLA Luskin students. After completing that first development project in Nicaragua, Monaghan was on to his next job with the international development company, Chemonics International Inc., which took him to Washington D.C., Kandahar and Kabul, Afghanistan, and Gaziantep, Turkey. For those years, he oversaw various projects and teams working to repair infrastructures, improve socio-economic conditions and support community groups impacted by development projects. It was sensitive work in tumultuous areas, but the conditions for development were ripe, though often dangerous. Monaghan recalls a harrowing experience in which a local member of his team was threatened by the Taliban. After returning home, he also learned that various locations that he frequented were later bombed or attacked by gunmen. It was around that time that Monaghan met and married his wife and began to think about graduate school. Monaghan and his wife began checking out the nation’s top 25 Urban Planning programs – UCLA Luskin was one of them. He ultimately chose UCLA Luskin over other schools because of the location and because of key recommendations from two colleagues at Chemonics, who were UCLA Luskin graduates. Adam stands near the bus his non-profit, Project WOO, converted for the residents of Gigante, Nicaragua. “This has been a very ‘choose your own adventure’ kind of experience,” Monaghan says of his time at UCLA where he also worked as project manager for Luskin’s new Global Public Affairs certificate program, which just graduated it’s first set of students. With help from the Timothy Papandreou Fellowship established by Urban Planning alumnus Timothy Papandreou, which is given to students that demonstrate innovation in projects that have solved problems or helped transform communities, Monaghan’s initial goals as a student were to focus on regional and international development and to learn GIS. Instead, he ended up choosing the design and development concentration and becoming interested in real estate. “I took Joan Ling’s real estate development and finance class in winter quarter of this year and my mind was blown. I didn’t know that real estate development was so similar to project management,” Monaghan says. It was in Professor Ling’s advanced real estate class where he met his new employer. Monaghan also encourages students to be open to doing hard work, even grunt work or things that don’t come naturally. “Do things you think you’re not good at and be a student in every opportunity. Go into everything with an open mind to learn.” But most of all, he says, have your eyes open and be tenacious. Joan Ling MA UP ’82 has been named 2014 Alumna of the Year by the department of Urban Planning. Ling currently works as a real estate advisor and policy analyst in urban planning. As a child, Ling developed a passion for carpentry and building that later inspired her to pursue a career in urban planning. Following graduation, Ling used her hands-on experience to improve public policy, legislation and government regulations. Among the many issues she has affected, highlights include reforming the California Environmental Quality Act (CEQA) to streamline affordable and urban in-fill housing production, negotiating the California Mello Act implementation in Los Angeles, running a successful voter initiative to authorize affordable housing development under Article 34 of the California Constitution, passing local ordinances giving land use incentives and protections for affordable housing development projects, and advocating for more and better targeted financial resources in California’s tax credit and bond-funded housing programs. She is currently working on promoting a range of housing choices in Los Angeles transit station areas, land use incentives for affordable housing, and a dedicated funding source in California. Ling has taken about 60 development projects totalling 1,400 units from acquisition through entitlement, financing, construction, marketing and building operations. Her projects include the first multi-family structure in the country awarded the gold certification by the U.S. Green Building Council’s Leadership in Energy and Environmental Design (LEED) as well as two buildings that received the National American Institute of Architect’s Design Honor Awards. Ling served as the Executive Director of Community Corporation of Santa Monica for 20 years. She has also worked for the Los Angeles County Community Development Commission; Kotin, Regan, and Mouchly; and The Planning Group. She was the Treasurer of the Community Redevelopment Agency of Los Angeles for over six years until its dissolution in February 2012. She is a director on the Housing California board and the chair of its Land Use and Finance Committee. In addition, she serves on the MoveLA Advisory Board. Ling holds a certificate from Harvard Kennedy School of Government after completing an 18-month program in Achieving Excellence in Community Development. Fannie Mae Foundation honored her as a National James A. Johnson Fellow. Ling also currently teaches real estate, housing and planning courses in the Urban Planning department.